Home › Home and Kitchen › New Meal Prep Containers W/ Food Scale For Weight Loss Bundle + Bonus Spirali..
New Meal Prep Containers W/ Food Scale For Weight Loss Bundle + Bonus Spirali.. THE ONLY COMPLETE MEAL PREP BUNDLE: Start Your Diet Right. 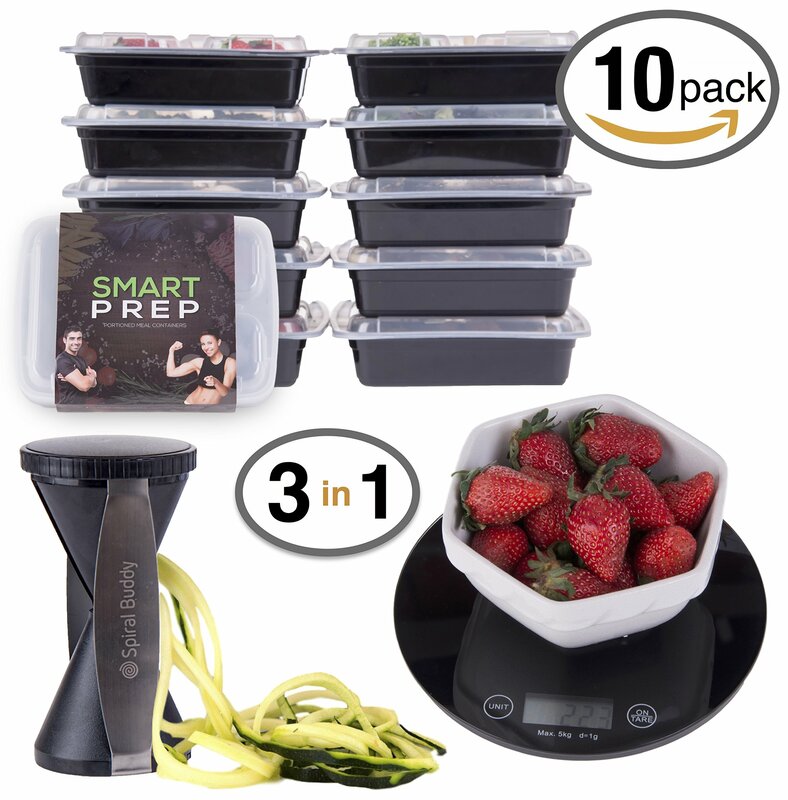 Whether You're a Beginner Just Looking for an Easy Solution to Dieting, or You're Looking to Get that Shredded 6-Pack, You've Come to the Right Place - This is What You Will Get: A Pack of TEN  Premium 3-Section Food Containers, 1 Ultra-Slim Touch Food Scale, AND 1 SpiralBuddy Veggie Spiralizer for Life-Changing Low-Cal Veggie Pastas. All for one Super-Discount Bundle Price. Invest in Yourself, Get Started Today. PACK OF 10 3-SECTION CONTAINERS: EASY MODE ON: Microwave Safe, Freezer Safe, Dishwasher Safe and Stackable. LONG LASTING: Durable Polypropylene, Perfect to Reuse Week in, Week Out! HASSLE FREE: Snap-Tight & Leak Proof Lids, Bring them Anywhere! SAFE: Tested by the EPA: Certified BPA & DEHP Free. The Key to Fat Loss is Portion Control. Avoid Overeating with the, 8oz, 8oz & 16 oz, Portions, Ideal for Weight Loss. Also Ideal for Bodybuilding and Healthy Meal Prep for a 21 Day Fix Diet. ULTRA SLIM FOOD SCALE INCLUDED - Is a Kitchen Scale Really Necessary for Beginners? YES! The Lessons You Will Learn About Correct Portions Will Be Invaluable to Your Health. A Few Extra Calories Each Day Can Add Up, Keeping You From Reaching That Weekly Calorie Deficit: The Key to Fat Loss. Your New Food Scale Makes Calorie Counting Easy, and it Looks Great on a Countertop. This One Simple Tool is the Key to Success. It Will Change How You Think About Food, and Transform Your Body. BONUS VEGGIE SPIRALIZER - 1 Serving of: Regular Spaghetti: 581 Calories/121g Carbs >> Spiralized Zucchini Spaghetti: 30 Calories/6.2g Carbs. What More Do You Need to Know? ;) Eating Low-Cal Just Got Easier, More Fun, and More Delicious. Make Delicious Low-Cal Veggie Noodles, Rices, Stir Frys, Salads, Buns, and Pastas with your Favorites like Cucumbers, Carrots, Sweet Potatoes, Zucchinis and More! BPA-Free Top-Quality ABS Plastic, 4 Slice Sizes, Premium Stainless Steel Japanese Blades. OUR 5-STAR PROMISE: We Are of Meal Preppers Ourselves, and We Created This Product Because We Believe it Has the 3 KEYS to Success When it Comes to Dieting, Whether You're Just Getting Started, or Cutting Down to Finally Get That Shredded 6-Pack. If you are not 5-Star Satisfied with your Investment, Simply Contact Us or Return it for FREE within 30-Days of your Order, No Questions Asked. We Promise it Will be the Best $40 Investment You Make All Year. Just Click 'Add To Cart' to Get Started! Balancing a healthy diet and a busy lifestyle is tough. The Ultimate Meal Prep Starter Kit will make your life easier, healthier, and happier, guaranteed. "Really love the quality of the products. Well worth it for all you get." -Tina "Great quality containers, not flimsy like another set I purchased." -Cyncris "I really like the digital scale" - Guyla WHAT YOU WILL GET: 10 Pack - Premium Reusable 3 Section Meal Containers: Snap-tight lids, Leak-proof seal, 32oz: 8oz, 8oz & 16oz sections Microwave, Freezer & Dishwasher safe Heavy Duty Plastic - BPA & DHEP Free 1 - Slim HD Digital Kitchen Food Scale Weigh your portions & track your calories every time Accurate from 0.05oz to 12lbs (1g to 5750g) Ultra Slim, HD Tempered glass finish, 4x stronger than normal glass 1 - SpiralBuddy Premium Vegetable Spiralizer Easily make delicious low-cal veggie noodles, pastas, rices & more 4 blade sizes, ultra-sharp stainless steel for effortless slicing 95% Less Calories & Carbs: Zucchini Pasta vs. Regular Pasta BONUS: 2 FREE E-BOOKS: The Easy Guide to Meal Prep for Fat Loss & Muscle Gain Delicious & Healthy Spiralizer Recipes OUR EPIC GUARANTEE: If you are not in LOVE with your new products, simply email us for a FULL refund or replacement within 30-days, no questions asked. Click 'Add to Cart' to Order Now Risk-Free.